Grid Connect® has developed the ARM7 microcontroller gridARM™ as System on a Chip solution (SoC) aiming for embedded applications in the field of industrial communication. The PEAK-gridARM evaluation board is a Linux-based development platform for the gridARM™ microcontroller. 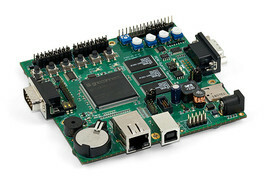 It has connectors for Gigabit Ethernet, High-speed CAN, USB 2.0, RS-232, SPI, and I²C. Digital and analog inputs of the evaluation board are manipulated by push buttons and potentiometers. The microcontroller state as well as the states for supply and data traffic are indicated by LEDs. A board support package (BSP) for Linux gives access to the hardware resources of the PEAK-gridARM evaluation board. The gridARM™ microcontroller by the U.S. company Grid Connect is distributed in Europe exclusively by PEAK-System.